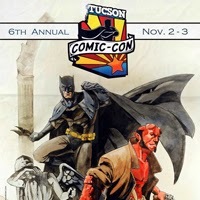 I'll be hanging out at the 6th annual Tucson Comic-Con, Nov 2-3. I am Honored to be sharing space with Zach Howard (The Cape, Wild Blue Yonder) at the Fantasy Comics table again this year. I'll be signing/selling books all weekend. I'll also be part of a panel of local Tucson talent on Saturday, 1 pm.